Students will use a CD Case Seed Viewer to observe how seedlings respond to Earth’s gravity and then create systems to mimic a low gravity environment, such as on the International Space Station. Felt – 1 square per CD case, cut to the size of the CD case. Darker colours of felt, such as brown or green, are preferable for observing the emerging roots and shoots. Note: Tomato seeds should be pre-soaked for about 20-30 minutes to help soften the seed coat and initiate the germination process. Materials: How do plants know which way to grow in space? Organizing working groups prior to the lesson is highly recommended to save time. Do not let students overwater the CD cases as too much water can kill the seedlings. Explain to students that plants can grow or bend towards or away from an external stimulus. This growth response is called a tropism (from the Greek word meaning, “to turn”). If a plant moves towards a stimulus, then it exhibits positive tropism; if a plant moves away from a stimulus, then it exhibits negative tropism. There are several types of plant tropisms including phototropism (response to light), hydrotropism (response to water), thigmotropism (response to touch) and geotropism – also known as gravitropism (response to gravity). Which type of tropism describes how a plant responds to light (phototropism), to water (hydrotropism) and gravity (geotropism – also known as gravitropism)? How would geotropism benefit a plant (roots have more of a chance of finding water and stems/leaves have more of a chance of getting enough light). Organize students into working groups of 3 to 4. Distribute one copy of BLM1: Plant Gravitropism Inquiry Summary to each group. 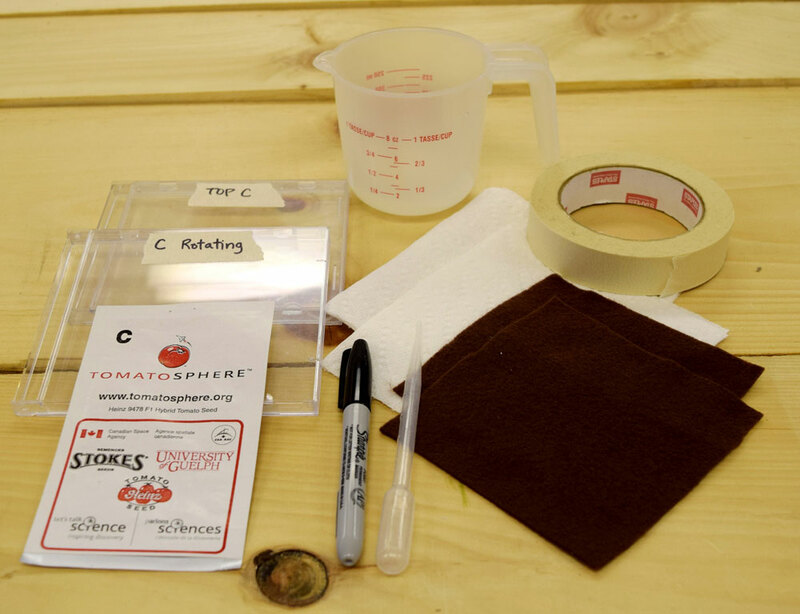 Optional: Have students watch the video Creating Testable Questions or read the science processes section on Asking Testable Questions on Tomatosphere™ if they need practice with developing testable questions. Have each student group develop a testable question for an inquiry that compares the germination of seeds in relation to gravity. One set of seeds will be exposed to the normal gravity conditions experienced on Earth and one set of seeds will be rotated daily so as to experience an environment in which the seeds don’t know which way is up or down in – similar to what they would experience in space. Have each group of students develop a hypothesis based on their inquiry question. Distribute two CD cases, two pre-cut felt pieces and two pieces of paper towel to each student group. Have the students fold the paper towel into quarters and wet both the paper towel and pieces of felt so that they are quite moist. Have them place the paper towel into the CD case and then place the felt square on top of the paper towel. Distribute the pre-soaked tomato seeds to the students and instruct them to place the seeds in an evenly spaced line across the middle of each piece of felt. Students should put a maximum of four seeds into each CD case. Figure 1: Open CD Case showing felt background and seeds after 5 days. Have each group label the two CD cases with masking tape, indicating which way is up (TOP). Stand the CD cases on their short ends with the word Top facing up. The CD cases should be placed in a warm location in the classroom where they will get some light during the daytime. Make sure that the seeds do not get too hot or that the felt dries out. In cold climates, the seeds may get too cold or freeze on a windowsill, so another warm, bright location in the classroom may need to be found. One of the CD cases will be left in a stationary position (static – normal gravity conditions) and the other CD case will be rotated 90 degrees clockwise on its short side each day (rotated – space conditions). Students should water the seeds each day. A plastic pipette or medicine dropper inserted around the edges of the case will help with this task. Encourage students not to open the case to add water and only add small amounts of water at a time to prevent the seeds from being washed out of the CD case or damaged. Ensure students have 10-15 minutes each day (or every other day) to make observations of their seeds in the CD case viewers. If available, provide magnifying glasses and/or stand magnifiers to help students make observations. Students should also measure the length of the roots and shoots and mark this on their diagrams. Recording Option: Students could take photos of the seeds each day or make a time-lapse video in addition to doing drawings, to serve as another form of recording observations. Provide each group with a copy of BLM2: Plant Gravitropism Sequence Organizer. Have students start the organizer on Day 1, the day the seeds are placed into the viewer. Instruct students to draw a picture of the seed(s) in each of the viewers and describe the appearance of the seed(s) in the space provided. Each time there is an observable difference in the appearance of the seed or emerging plant, have students draw their observations and describe the changes taking place on the sequence organizer. Continue to make daily observations until the seeds have small leaves (cotyledons) and roots (radicle) (see Figure 2). For more about the germination process, see the Seeds and Germination Backgrounder. The observation period for this inquiry will end shortly after the seeds have developed cotyledons. Which grew first – roots or shoots? Why do you think the seedling grow this way? Was there anything surprising about the results? If so, describe them. Do you think that other tropisms were also affecting the seedlings? If so, which ones and why? How was this experiment similar/dissimilar to what plants would experience on the International Space station? Why is gravitropism important for plants? Would it still be important for plants in space? How could you make this experiment more closely resemble space conditions? How could you set up the experiment to remove the effects of other tropisms? What other variables could you change in this experiment? Germinate other types of seeds in the CD Case Viewers. 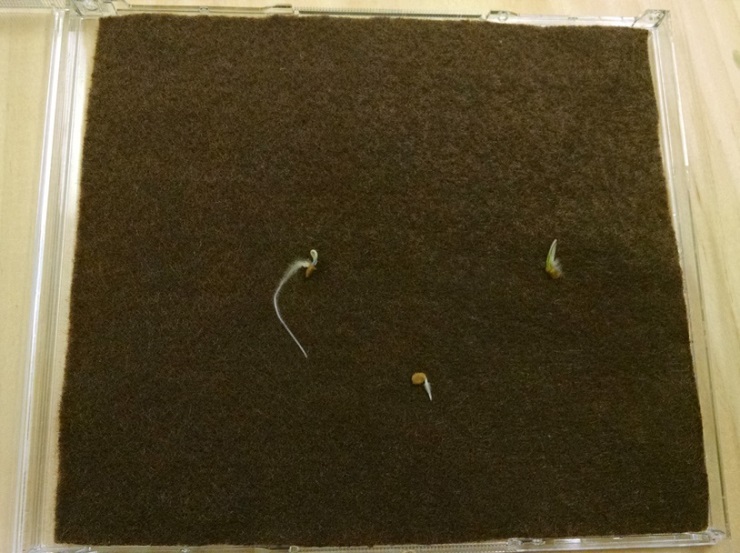 Compare the germinate rates of soaked versus non-soaked tomato seeds. Have students create a mechanical system that turns the CD cases automatically. Students can try to keep the seedlings growing by gently opening the case a little. It is challenging to transplant seedlings started in this way because the roots become stuck to the felt. If you do attempt to transplant the seedlings, lift the felt out and cover the roots portion with soil, leaving them attached to the felt. Ensure the stem and leaves remain above the soil and keep the soil moist. Connect with local Let’s Talk Science Outreach to bring hands on activities into your classroom.